Abstract. The Canadian Forest Fire Weather Index (FWI) System is the mostly widely used fire danger rating system in the world. 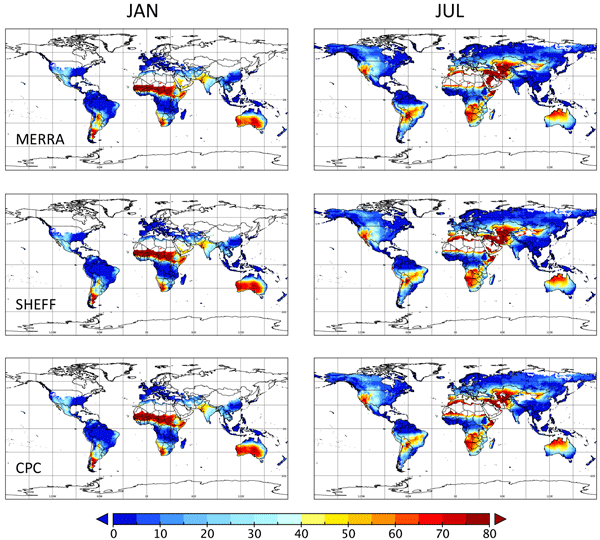 We have developed a global database of daily FWI System calculations, beginning in 1980, called the Global Fire WEather Database (GFWED) gridded to a spatial resolution of 0.5° latitude by 2/3° longitude. Input weather data were obtained from the NASA Modern Era Retrospective-Analysis for Research and Applications (MERRA), and two different estimates of daily precipitation from rain gauges over land. 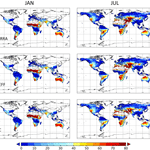 FWI System Drought Code calculations from the gridded data sets were compared to calculations from individual weather station data for a representative set of 48 stations in North, Central and South America, Europe, Russia, Southeast Asia and Australia. Agreement between gridded calculations and the station-based calculations tended to be most different at low latitudes for strictly MERRA-based calculations. Strong biases could be seen in either direction: MERRA DC over the Mato Grosso in Brazil reached unrealistically high values exceeding DC = 1500 during the dry season but was too low over Southeast Asia during the dry season. These biases are consistent with those previously identified in MERRA's precipitation, and they reinforce the need to consider alternative sources of precipitation data. GFWED can be used for analyzing historical relationships between fire weather and fire activity at continental and global scales, in identifying large-scale atmosphere–ocean controls on fire weather, and calibration of FWI-based fire prediction models. How to cite: Field, R. D., Spessa, A. C., Aziz, N. A., Camia, A., Cantin, A., Carr, R., de Groot, W. J., Dowdy, A. J., Flannigan, M. D., Manomaiphiboon, K., Pappenberger, F., Tanpipat, V., and Wang, X.: Development of a Global Fire Weather Database, Nat. Hazards Earth Syst. Sci., 15, 1407-1423, https://doi.org/10.5194/nhess-15-1407-2015, 2015.